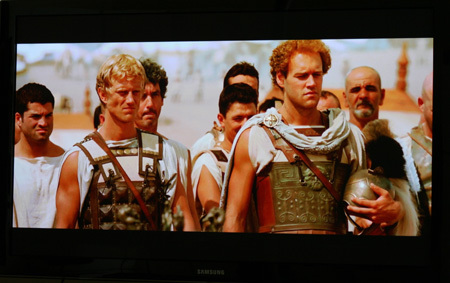 Stunning detail, color and contrast from the Blu Ray version of Alexander. First we start off with an aesthetically stunning TV model in the C6500. At 1.4" depth and subtle Touch of Color looks this model looks high end through and through. It adds the Samsung Internet Applications and a few other features while forgoing the expensive 3D ready option. It falls right in the center of Samsung's plasma TV offerings for 2010/2011. Calibration Notes: Right out of the box you will notice a strong blue push from the Standard setting. Changing this to the Movie setting seems to brighten the picture while adding warmer color tones that make the picture much more realistic. This gets you going toward D6500K which is more complicated to obtain on this plasma than many TVs. Follow the picture settings below to calibrate. 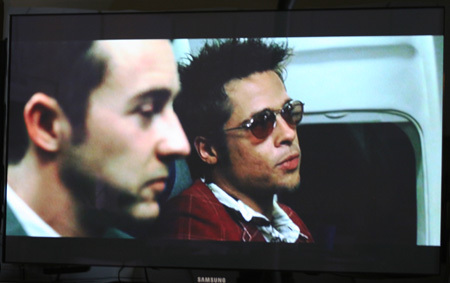 The C6500 presents a much softer picture from standard definition programming such as this scene from the 480i DVD of Fight Club. Up conversion from 480i standard definition programming: Edges were fuzzy with grain from a standard definition source signal. Black levels clearly were not as impressive with standard definition content as with HD. We were not impressed with the up conversion processing overall. 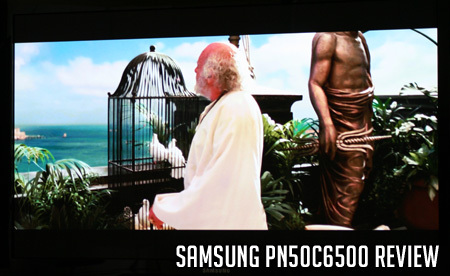 This was also evident in HQV 480i processor testing. With some darker content we felt it necessary to turn the cell light all the way to maximum setting of 20 rather than the calibrated 15 just to get a little more light introduction. Contrast was tuned to 90. That said, color rendition is realistic and pleasing. The C6500 can at times suffer from side to side panning judder effects, which we also verified during testing. Beautiful contrast and brightness is displayed in this shot from the Blu Ray version of Alexander. HD Picture Quality: HD programming takes a huge leap on this TV with black levels and color vibrancy improving dramatically over standard definition picture. Picture detail was also much better though we still felt that the picture can be soft around the edges – not as crisp as some TVs we have viewed. The internal processing in the C6500 takes the HD input much better. Picture depth is very good with HD content from the Ultra Clear plasma panel. Black Level/Contrast: Black levels appeared very saturated with an HD signal input and moderate with a standard definition signal input. They didnt seem as inky as we remember them from last years model, though they were plenty sufficient. Post calibration contrast through HD HDMI measured a very impressive 2274:1, one of our highest contrast measurements. Dark Shadow Detail: Though blacks are intense, dark shadow detail was not impaired by oversaturation with HD content – an excellent result. With SD content there was much less detail in darker areas. Color Rendition/Color Accuracy: Once the picture is calibrated, the C6500 delivers extraordinarily accurate, lively and consistent colors with HD programming. Colors were also very realistic from standard definition. This shot from the 480i DVD of Fight Club displays good gray scale capacity to capture the subtle changes in the color and light. Viewing Angle/Off Axis Viewing: Viewing angles were perfect with no degradation of contrast at even 35 degrees. The plasma panel adds a lot of depth to HD images. However, there is glare from the Ultra Clear Panel technology. Motion Lag: While there is no motion lag, we did note judder during side to side panning. The C6500 series plasma adds the much improved Samsung Internet Applications which have a variety of choices such as Netflix, YouTube, Blockbuster, Pandora, and Yahoo! Widgets. You will likely find some of these more useful than others, but overall the list and functionality is improved. We still dont quite get why someone would want to have the Yahoo! 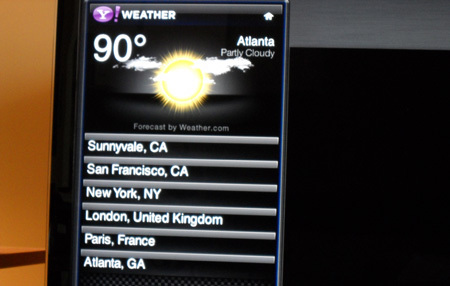 Widget displaying the weather or stock quotes while watching other programming, but to each his own. The LAN connection may also be used for networking to various devices. There is a dedicated button on the remote control for Internet options. 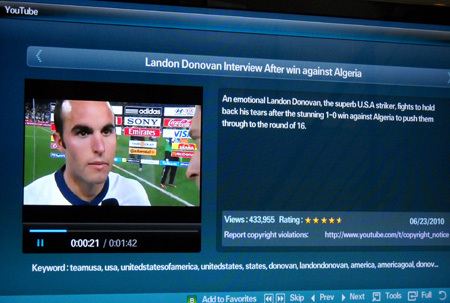 Landon Donovan on YouTube after the big win against Algeria. The Anynet+ feature is included. This feature allows connection and communication to other Samsung devices that support this feature. It's a yada yada older feature to try to purchase your allegiance to Samsung. It may be useful in a home theater situation or for a DVD recorder. Aesthetic Considerations: Black Touch of Color? Hmm. Well, we like the looks anyway with the sleek super thin design. Thinner is better as long as there is no downgrade in quality or large increase in price right? The stand is very heavy, attractive and swivels side to side to 20 degrees. The TV is pretty nice and slim at 2.8" in depth. Remote Control/Menu Funtionality: The remote control is logically laid out and easy to use with a matte black finish. It's also conveniently backlit. The menu is the same as with all Samsung 2010 models. It's also well laid out. However, we do find it cumbersome to use at times. 4832Picture: The menu system presents itself as an overlay with a convenient tutorial feature appearing in the bottom of the screen. The menu is thorough enough if not a bit tedious to maneuver around. Audio Output: There is plenty of volume with most sources, however we weren't impressed by quality especially voice/dialog. There is a feature option in the audio section to enhance surround sound and/or dialog. While this feature did seem to help some, voice was overwhelmed by background in much of the content viewed. Sound mode options include Standard, Music, Movie, Clear Voice, and Amplify. The Clear Voice option does help voice/dialog reception from the 10W X 10W speakers. The 50C6500 costs around $1350 at many reputable online dealers. This is a very compelling mid range offering from Samsung because it leaves off the extra expense of 3D compatibility for which most manufacturers are charging upwards of $500. It does include the much improved Samsung Internet Applications and you get some nice picture quality, though soft and grainy with standard definition programming. The depth with HD is superb. Competition comes from Panasonic in the TC-P50S2 and TC-P50G25, as well as the LG 50PK750. And then there is LCD competition, which we still feel plasma beats though the battle is getting closer. Overall, this TV offers excellent value.